Sean Wilentz is the George Henry Davis 1886 Professor of American History at Princeton University, where he has taught since 1979. He is author of many books, including The Rise of American Democracy: From Jefferson to Lincoln. As the New York Times at present lacks the proper format for a debate over an Op-Ed of mine that it published on the origins of the Electoral College, “The Electoral College Was Not a Pro-Slavery Ploy,” I am grateful to History News Network for giving me the opportunity to reply to Akhil Reed Amar and his Op-Ed, “Actually, the Electoral College Was A Pro-Slavery Ploy.” I look forward to continuing the debate on slavery and the Constitution, which certainly includes the inception of the Electoral College but also involves the larger and, I believe, more important historical issues raised in my recent book, No Property in Man: Slavery and Antislavery at the Nation’s Founding. Earlier this month, I wrote on Op-Ed piece for the New York Times disputing claims that the Electoral College originated as a slaveholders’ ploy at the nation’s founding in 1787. The issue has become important recently as part of a larger debate about the Electoral College. In the wake of two presidential elections, in 2000 and 2016, where the electoral system overruled the popular will, many Americans, especially inside the Democratic Party, have declared that the system ought to be seriously amended, if not eradicated in favor of direct popular election of the president. I have long believed the Electoral College at least needed fixing. The point of my Op-Ed, though, was a different one, having to do with history. Last September, I published a book that challenges the prevailing wisdom about the role of slavery at the Federal Convention in 1787. Almost as an aside, the book briefly discusses how the framers created the Electoral College and argues that, on this matter at least, the prevailing wisdom is correct: the Electoral College, I wrote, arose out of Southern delegates’ efforts to give as much extra power as they could to the Southern slaveholding states. Since then, in part because of the current public debate over the Electoral College, I closely re-examined the issue and concluded that, like most of my fellow American historians, I have been wrong about slavery and the Electoral College. In advance of the publication of a paperback edition of my book this fall, I duly prepared a new preface that explained my change of mind. As the general debate about the Electoral College heated up, though, and as the Electoral College’s opponents began decrying its origins in slavery, I thought I ought to write an essay on the subject in a more public venue, lest anything I wrote in my book be taken to support a claim I no longer believe. I wrote that essay and the Times published it – and very quickly thereafter, the Times published another Op-Ed by Akhil Reed Amar disputing and dismissing my piece. Not surprisingly, I think that Amar’s response is mistaken. His account turns the origins of the Electoral College into a simple story that fits well with commonplace current views of slavery and the U.S. Constitution. Disarmingly straight-forward, it seems almost self-evidently true. But in order for his claims to hold up, Amar’s story has to ignore a great deal that either does not fit or that flatly contradicts him: for example, that the Electoral College emerged as an alternative to another proposed system that also protected slavery; or the fact that the leading pro-slavery states actually voted against what would become the Electoral College, even though it promised to give more protection to slavery than the system they supported. On closer examination, though, Amar’s response is even more deeply flawed and in fundamental ways. But before I get into those defects, let me provide a basic chronological narrative of how the framers created the Election College. 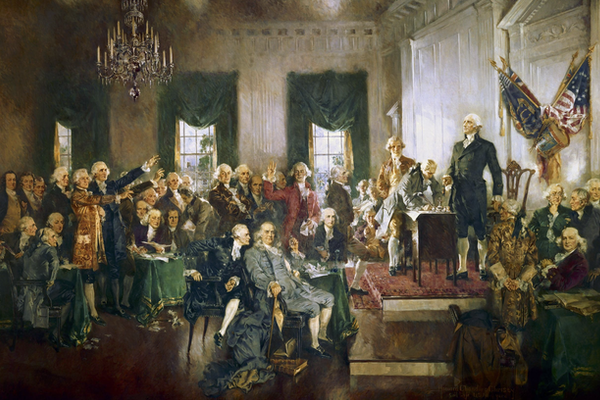 On June 2, 1787, shortly after the convention to frame the new Constitution opened in Philadelphia, the delegates endorsed the creation of a national executive, the president, who would be elected by the national legislature and serve a single seven-year term. In mid-July, though, when the delegates began to favor making the executive eligible for re-election, the consensus for congressional election of the president faltered. The convention debated the matter sharply. At one point, Hugh Williamson, a non-slaveholding delegate from North Carolina, mentioned that direct election would hurt Virginia, the state with the most slaves, because enslaved men “will have no suffrage.” The preponderance of the objections, though, from southerners as well as northerners, echoed the disdainful observation of George Mason – another distinguished delegate and an actual Virginian -- that having the people at large choose the president would be like referring “a trial of colours to a blind man.” On July 17, the convention defeated a motion for direct election by 9 states to 1. A third group of delegates, however, supported an intermediate elector plan, as a middle ground that would provide a more attractive alternative to legislative selection than direct election. Their basic idea was to give the authority for electing the president to independent electors, possibly chosen by the people, possibly by the state legislatures. The germ of such a plan had appeared in the convention debates much earlier, when James Wilson of Pennsylvania realized that a direct election proposal he was offering would fail. But after the dismal defeat of the direct election proposal on July 17, the supporters of an electoral system, including some like Wilson who had previously spoken in favor of direct election, found their collective voice. On July 19, William Paterson of New Jersey, who happened to be a critic of slavery, offered a proposal “that the Executive should be appointed by Electors to be chosen by the States”; Wilson, who was more keenly antislavery than Paterson, chimed in that it was now the “unanimous sense” of the convention that the executive be chosen by “an election mediately or immediately by the people.” James Madison of Virginia, the slaveholder later known as the father of the Constitution, gave a speech that, while it praised the defeated idea of direct election, instead backed an electoral system. A direct system, he observed, for all of its strengths would weaken the slaveholders' power as the electoral system under consideration would not. Momentum for independent electors grew. A motion to replace legislative election of the president with an electoral system passed easily, 6 states to 3, with one state divided. It is important to pause here and explain the place of slavery in the different proposals for choosing the president. The congressional selection plan gave the slaveholding states a singular advantage as the convention had already approved the notorious three-fifths clause. This clause stated that apportionment of the seats in the lower house of Congress would be calculated by including three-fifths of the total of each state’s enslaved population. As the three-fifths addition would apply if Congress was selected to choose the president, the congressional mode had a powerful appeal to the South. By contrast, as Madison pointed out in his speech, a direct election system would mean that the non-voting slave population would count for nothing in selecting the president, which Madison said would prevent any Southerner from winning the presidency. The electoral system under consideration, however – a detail that Madison did not mention -- would count all of each state’s inhabitants, slave and free, toward apportioning electors, which in principle would give the slaveholding states even more additional votes than the congressional system gave them with the three-fifths rule. The really crucial point to remember here is that the electoral system began gaining support as an alternative not to direct election but to the congressional plan, which also protected slavery. Because, except to its strongest supporters, direct election seemed dead and buried, the convention did not face a choice between a system that favored slavery and one that did not but between two systems which favored slavery in different ways. This fact is essential to understanding the convention’s decision to adopt the electoral system and everything that followed. Although it was momentarily the convention majority’s choice, the electoral system still had some formidable foes, chiefly in the three most ardently proslavery states, North Carolina, South Carolina, and Georgia. That these states were so opposed to an electoral system is, to say the least, ironic given today’s conventional historical wisdom, but those states had their reasons. Lower South delegates instead favored what had been the approved system, selection of the president by Congress. Their calculations had nothing to do with protecting slavery; indeed, the electoral system promised to offer them additional votes for the president above and beyond what their favored congressional system did. Rather, they scorned the electoral system on elitist grounds, charging that the independent electors, unlike congressmen, as Hugh Williamson put it, “would not be the most respectable citizens” but men of inferior rank, open to bribery and other forms of corruption. And when the convention approved the electoral system, the only three states that voted against it were North Carolina, South Carolina, and Georgia. The lower South states, though, would not easily abide their loss, and they joined in mounting a counterattack. Five days after it approved the electoral system, the convention, with the full support of the lower South, reversed itself and rejected the electoral system -- seemingly for good – and restored the choice of the executive to Congress. The day after that, James Madison, who now believed an electoral system was forever doomed, dissented from the convention’s switch and strongly endorsed direct popular election, with hope that the system crushed a few days earlier might yet be revived. For more than a month thereafter, the convention continued to support congressional election of the president, but a major dispute broke out over procedure; and so, in the convention’s waning days, a special committee of eleven, appointed to settle the convention’s still unfinished business, offered a comprehensive plan of its own. It was this committee that revived the electoral system idea and effectively invented the Electoral College we know by proposing, for the very first time, apportioning the electors according to each state’s combined representation in the House and Senate. Morris’s speech raises intriguing questions and possibilities about the committee’s private discussions. With appointment by Congress on the ropes, did Morris seize the opportunity to resuscitate his arguments in favor of direct popular election? Might James Madison, who was also on the committee, have replied that, although direct election was the “fittest” system, its disadvantages to the Southern slave states recommended an electoral system instead? Might another committee member, the New Yorker Rufus King, have restated his reasons, shared in by William Paterson, for endorsing direct election? In the absence of more detailed evidence, it is impossible to know. What is clear is that, as a majority of the committee opposed direct election, it was no more in the cards now than it ever had been. At all events, the convention at last approved the committee’s recommendations, with modifications, eleven days before the convention completed its work. The only opposition came from North Carolina and South Carolina, fighting to the bitter end for election of the president by the Congress. Practically everything in this account, however, is either illogical, false, invented, or factually incomplete. Let’s start with Amar’s first assertion that James Madison supposedly described a popular vote system as a “political nonstarter.” Amar is referring to the speech that Madison gave on July 19, the day the convention approved – temporarily, as it turned out – an electoral system. In that speech, Madison indeed recommended an electoral system, noting that the defeated direct election system he still deemed the “fittest” would hurt the slave South “on the score of the Negroes.” “The substitution of electors,” Madison said, would correct for these problems. But to pluck that speech out of context, as Amar does, is to distort not just Madison’s thinking but the purport of what he said. Recall that five days after Madison delivered that speech, the convention reversed itself and rejected the electoral system. Then recall that, a day later, Madison, now believing the convention would never approve an electoral system, dissented from the convention’s switch and strongly endorsed direct popular election, still hoping that it had a chance -- the system that Amar says Madison ruled out completely because it was unacceptable to the South. Amar tells a different tale. According to him, Madison dismissed the direct voting system as “nonstarter” because it hurt the slaveholding South. The evidence shows this is false. Although he would have preferred an electoral system for reasons having to do with slavery, Madison hardly rejected direct voting because it was a “nonstarter” for the slaveholders or for any other reason. As soon as an electoral system seemed to be off the table, he returned to supporting a direct system, despite the long odds against it, rather than support a congressional system that was favorable to slavery but also vulnerable to corruption. Amar’s second assertion is more consequential but equally wrong; indeed, it is an invention. By his account, Madison’s speech of July 19 explained to the convention why direct election would have been a “dealbreaker” for the slaveholding South and that the convention subsequently rejected direct election of the president. The trouble is, as the basic narrative shows, by the time Madison delivered this speech, he could not have been warning the convention against direct election. The reason is simple: the delegates had already soundly defeated direct election two days earlier. Amar’s third assertion is illogical, incomplete, and invented, all at the same time. He asserts that, at Madison’s prompting, the delegates or some of them, began wondering: “if slaves could somehow be counted in an indirect system, maybe at a discount (say, three-fifths), well, that might sell in the South.” Here, Amar claims, begins the real story of the inception of the proslavery Electoral College. Yet the scheming that Amar imputes to unnamed delegates about an indirect system is pure fiction. Moreover, as we have seen, the proslavery lower South actually rejected the idea of an electoral system despite its relative advantages to slaveholders, preferring a system of congressional election based on a formula that would have provided the slaveholding states a smaller number of electors. In all, Amar wants us to believe that the delegates sowed the proslavery seeds of the Electoral College when Madison explained to them that the South would never agree to a direct election system – a system the convention had, in fact, already defeated. He would have us bypass the fact that the most vociferous proslavery states, instead of rallying to that plan, resisted it in favor of another. And he would have us overlook that the plan the proslavery states favored promised to give them a smaller proportion of the vote for president than the electoral plan they opposed. To be sure, there are some traces of truth in Amar’s argument. First, because the framers tolerated slavery where it existed from the very beginning of their deliberations, slavery touched and often distorted many aspects of the new federal government. In the case of electing the president, the framers’ toleration led to the Southern slave states getting extra power, derived from the three-fifths compromise struck early on in the proceedings. Second, during the debates over the mode of electing the executive, two Southern delegates did note that a system of direct election of the president would hurt the slave states. But all of this put together is still a far cry from demonstrating that the Electoral College originated as a proslavery ploy. A good way to summarize what actually happened inside the convention is to recall the place of slavery in the different plans that the convention considered about electing the president. The delegates weighed three options: the president would be selected by direct popular vote, by Congress, or by electors who would be chosen either by the people or the state legislatures. Direct election failed, but not because it was intolerable to the slaveholders, as Amar maintains. It failed because it enjoyed little support in the convention, for reasons that had nothing to do with slavery. The real choice for the framers was between the congressional method and the electoral method. Both methods gave the slave states an extra measure of power in selecting the president; so once direct election was scrapped, the convention was bound to grant the slave states some sort of bonus. But this was because the great majority of the convention did not trust in the people at large to choose the president. There was no slaveholders’ ploy. Another way of putting this is to concede that the full story of the framers, the Electoral College, and slavery shows that proslavery concerns did indeed arise at the crucial point when the convention’s decided to reject direct popular election of the president. But the role they played amounted to twelve words in an insignificant speech by Hugh Williamson, and, at a great stretch, some remarks by James Madison after the direct voting plan had been defeated. Beyond that, proslavery concerns had nothing to do with the convention’s debates over what became the Electoral College; two northern critics of slavery, William Paterson and James Wilson, opened the debate that led to the temporary adoption of an electoral plan; proslavery delegates resisted that plan and helped get the convention to abandon it; and when the convention finally settled the issue, it agreed at the last minute to scrap what had long been the lower South’s preferred arrangement, selection by the Congress, in favor of a system of electors. The claim that the Electoral College originated as a proslavery ploy is a myth that can be sustained only by misreading the evidence or by simplifying in order to manipulate it. Amar offers some additional criticisms of my Op-Ed’s discussion of the effects of the Electoral College after 1787. These chiefly involve a paragraph on the election of 1800-01, which argues that the Federalists’ interference with the electoral vote in Pennsylvania offset the extra votes that Thomas Jefferson received as a result of the three-fifths compromise. My point was simply that it is badly mistaken to say that the compromise unfairly handed Jefferson the presidency. Amar interprets this as an attempt on my part “to erase the ugly fact that the South had extra seats in the Electoral College because of its slaves.” His imputation is offensive as well as mistaken. To describe how the evil of slavery prevented the outrageous theft of a presidential election is not to evade or apologize for slavery and the three-fifths clause. It is to describe a terrible irony. In the 21st century, the Electoral College has twice thwarted the popular will. The debate over its future cannot be helpfully advanced by distorting its complex origins, in which slavery’s role was not central but incidental.